Lockport, IL—Will County State’s Attorney James Glasgow backed up by Illinois State Police Captain Carl Dobrich held a guarded press conference to Chicago area at 8:30 PM tonight. They released details of a 2 count Grand Jury Indictment of retired police sergeant Drew Peterson in connection with the death of Peterson’s third wife, Kathleen Savio. Peterson was arrested after a street stop by state police at Lily Cache Lane and Weber Road in Bolingbrook without incident at 5:35 PM Chicago time. The state police were kind enough to invite the media for their big capture. They also managed to choreograph Peterson’s arrest while his lawyer Joel Brodsky was boarding a plane to New York. The bond set on the warrant was an previously unheard $20 million. That will either get lowered by the trial court or Brodsky can be counted to take it to the Illinois Court of Appeals. Peterson children were rounded up for supervision either by DCFS or Peterson’s oldest son. Police also executed yet another search warrant on Peterson’s home. Glasgow admitted that they have an uphill battle with a new Illinois law drafted specifically to the Peterson case that allows the use of third party hearsay under certain conditions. This untested law may well be ruled patently unconstitutional. Only time and judicial review will provide answers to these questions. Already the people that hate Drew Peterson are out celebrating the arrest. I suspect they will be disappointed when the bail is reduced, and due process takes its course. In the mean time both Dobrich and Glasgow vowed to keep searching for Stacy Peterson. The state police also managed to choreograph Peterson’s arrest while his lawyer Joel Brodsky was boarding a plane to New York. I will have updates and will be on the Geoff Pinkus Show on WIND 560 tonight talking about these developments. "JOLIET – Will County State’s Attorney James Glasgow and Illinois State Police Captain Carl Dobrich announce that Drew Walter Peterson was arrested today (Thursday, May 7, 2009) after a Special Grand Jury issued an indictment for first-degree murder alleging he killed Kathleen Savio five years ago. At the request of State’s Attorney Glasgow and Illinois State Police detectives, Circuit Judge Daniel Rozak issued a warrant for Peterson’s arrest Thursday afternoon. Judge Rozak set bail for Peterson at $20 million. He must post 10 percent or $2 million to secure his release while awaiting trial. Illinois State Police arrested Peterson without incident late Thursday afternoon during a traffic stop at Weber Road and Lily Cache Lane in Bolingbrook. Kathleen Savio, who was Peterson’s third wife, was found dead in her bathtub on March 1, 2004. Charges were not filed in the case five years ago by the prior state’s attorney who held office when Kathleen Savio was murdered. Glasgow reopened the case and convened a Special Grand Jury to investigate her murder in November 2007. The Special Grand Jury also is investigating the disappearance of Drew Peterson’s fourth wife, Stacy Peterson. Drew Peterson is scheduled to be arraigned at 1:30 p.m. Friday, May 8 in courtroom 405 at the Will County Courthouse, 14 W. Jefferson St., Joliet. The Will County State's Attorney's Office reminds the public that an indictment is not evidence of guilt. A defendant is presumed innocent and is entitled to a fair trial at which the government has the burden of proving guilt beyond a reasonable doubt." He'll get his day in court. 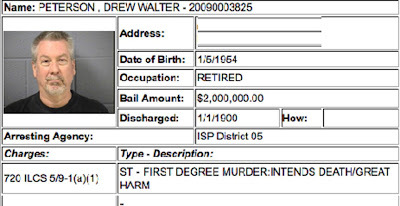 I think a lot of this is politically motivated and personal between Drew, his attorney and the State Police. The Scott Peterson case shows you can be found guilty of murder and end up on death row without any evidence, as long as you can be painted as a bad person. Things don't look good for this Peterson either in my opinion. WE WENT FROM TABLOID NEWSPAPERS TO NOW TABLOID JUSTICE.THIS IS NOT ABOUT SOCIALISM , I BELIEVE ALL THE WILL COUNTY STATE ATTORNEY IS A REPUBLICIAN.JUSTICE IN ILLINOIS MEANS "JUST US" THE PEOPLE WHO HAVE THE POWER OR THE PEOPLE WHO CAN BUY THE POWER. REGULAR PEOPLE DON'T HAVE CHANCE ANYMORE.